- The pairing of well-liked star Matt Damon with a venerable director like Ridley Scott is an appealing combination for this well-reviewed sci-fi survivalist adventure. - Andy Weir's book -- on which the film is based -- has been a consistent best-seller, adding to the film's built-in upfront appeal. - Social media activity is generally strong, receiving an extra boost in the past few days thanks to NASA's real life announcement of discovering flowing water on Mars. You can't beat free press like that. - Damon's last major starring vehicle, Elysium, opened to underwhelming numbers -- although that film was somewhat held back by more modest reviews and a shaky marketing campaign. - Competing against the expansion of fellow well-reviewed pic Sicario could cut into the adult audience. 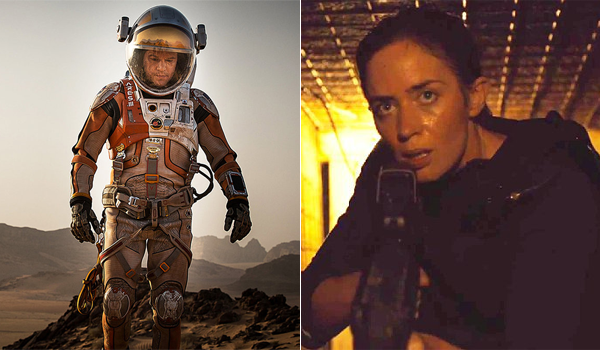 - Overall Facebook and Flixster totals aren't on the same level of Interstellar, although the momentum has slowly started to shift more in favor of The Martian lately. - Strong reviews are propelling Denis Villeneuve's follow-up film to Prisoners. - Emily Blunt continues to pick strong leading roles following the great reception of her supporting turns in Looper and Edge of Tomorrow. - Twitter activity is very respectable for the genre. - There's certainly a history of strong limited release performers not translating quite the same once they reach nationwide play. - The darker tone of the film could lead to more back-loading with the competition in the market, not to mention Black Mass recently playing to a similar audience. - With the huge buzz behind The Martian, that further mutes expectations for an immediate breakout -- but the chance is certainly still there. BoxOffice projects this weekend's top ten films will gross approximately $144.2 million. That would mark a 6 percent improvement over the same weekend last year, whose top ten tallied $136.3 million as Gone Girl and Annabelle bowed to excellent $37.5 million and $37.1 million openings, respectively.